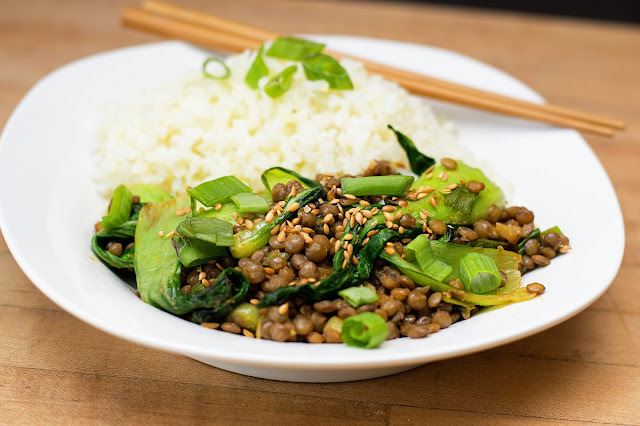 Meatless March continues with this Lentil and Bok Choy Stir Fry. Part of the fun of going meatless for a month has been working with ingredients that I normally wouldn't. When I was at Trader Joe's a couple weeks ago, I got some bok choy. Usually I would use broccoli or spinach in my stir fry, but today I used this lovely Asian green and I have to admit it, was delicious! Full of fiber, protein, and an assortment of vitamins, bok choy is a super food and is so good for you. And since it was something new, I had to learn how to prepare it. Here are the steps you will need to take before you cook the bok choy. Firstly you will trim the end of. Secondly, you will separate the bok choy leaves. There is a lot of dirt and sand around the root area that will have to cleaned out. Now you will rinse the bok choy thoroughly. I also like to put it in my salad spinner. I will link the one I use (HERE). Since this is a stir fry you will want to make sure you have everything prepped and ready to go. Coconut amigos are another new-to-me ingredients. Soy free and gluten free, I have found it to be a wonderful alternative to soy sauce. It can be a little difficult to find so I will link where you can purchase it (HERE), but you can also you a low sodium soy sauce instead. Combine the coconut amigos, rice wine vinegar, maple syrup, and sriracha sauce in a mixing bowl and whisk until smooth. Place a deep skillet over HIGH heat and add a little oil. 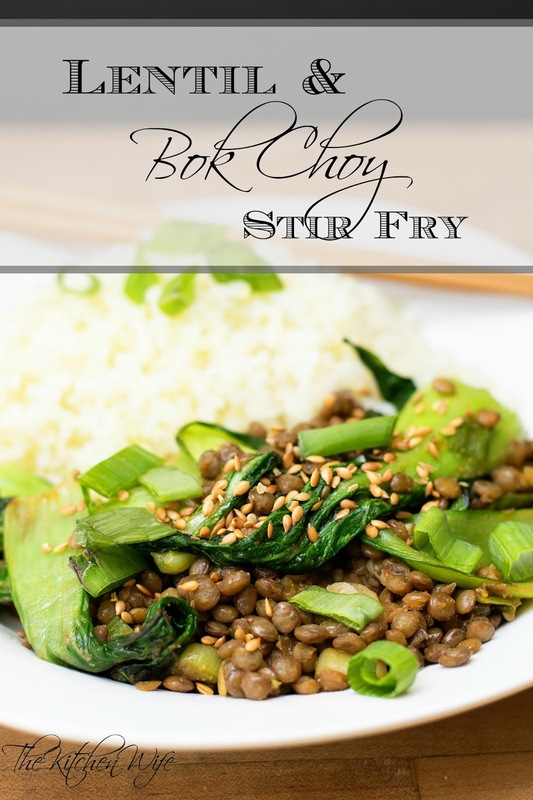 Once the pan is smoking hot add the bok choy and sautéed for 2-3 minutes. Next, add the green onions and garlic and cook for 2-3 minutes. Now add the fully cooked lentils (you can use canned) to the pan and cook for 2-3 minutes. Finally add the sauce, toss everything until it is fully coated and cook 2-3 minutes. Look at how lovely this is! If you are not using canned lentils, prepare the lentils according to the directions on the package. Trim the bottom root off the bok choy, separate the leaves, rinse them, and put through a salad spinner if you have one. Prepare all your vegetables and combine the coconut amigos (or soy sauce), rive wine vinegar, maple syrup, and sriracha in a bowl to whisk together. Place a skillet over high heat and add some oil. Allow the pan to get smoking hot. Add the bok choy and cool 2-3 minutes. Add the green onions and the garlic to the pan and cook 2-3 minutes. Add the lentils to the pan and cook 2-3 minutes. Add the sauce, toss everything together until it is all coated with the sauce. Cook 2-3 minutes. Service with your choice of grain or rice.